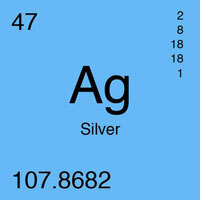 (Nanowerk News) Researchers from Brown University have shown for the first time how ingesting too much silver can cause argyria, a rare condition in which patients’ skin turns a striking shade of grayish blue. Scientists have known for years argyria — a condition that turns the skin blue — had something to do with silver. Brown scientists have figured out the complex chemistry behind it. Scientists have known for years argyria had something to do with silver. The condition has been documented in people who (ill advisedly) drink antimicrobial health tonics containing silver nanoparticles and in people who have had extensive medical treatments involving silver. Tissue samples from patients showed silver particles actually lodged deep in the skin, but it wasn’t clear how they got there. As it turns out, argyria is caused by a complex series of chemical reactions, Hurt said. His paper on the subject, authored with Brown colleagues Jingyu Liu, Zhongying Wang, Frances Liu, and Agnes Kane, is published in the journal ACS Nano ("Chemical Transformations of Nanosilver in Biological Environments"). Hurt and his team show that nanosilver is broken down in the stomach, absorbed into the bloodstream as a salt and finally deposited in the skin, where exposure to light turns the salt back into elemental silver and creates the telltale bluish hue. That final stage, oddly, involves the same photochemical reaction used to develop black-and-white photographs. To re-create this end stage, the researchers shined ultraviolet light on collagen gel containing silver ions. The light caused electrons from the surrounding materials to jump onto the unstable ions, returning them to their original state — elemental silver. This final reaction is ultimately what turns patients’ skin blue. The photoreaction is similar to the way silver is used in black and white photography. When exposed to light, silver salts on a photographic film reduce to elemental silver and darken, creating an image. Despite its potential toxicity, silver has been valued for centuries for its ability to kill germs, which is why silver nanoparticles are used today in everything from food packaging to bandages. There are concerns however that this nanoparticle form of silver might pose a unique health threat all its own.